Now we know that whatever the law says speaks to those who are subject to the law, so that every mouth may be shut and the whole world may become subject to God's judgment. Now we know that whatever the Law says applies to those who are under the Law, so that every mouth may be silenced and the whole world held accountable to God. Now we know that as many things as the law says, it says to those in the law, so that every mouth may be stopped, and all the world may become accountable to God. Now we know that whatever the Law says, it speaks to those who are under the Law, so that [the murmurs and excuses of] every mouth may be hushed and all the world may be held accountable to God. 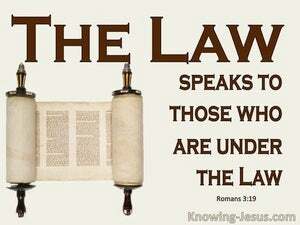 Now we [all] know that everything the law says applies to those who are under [obligation to obey] that law, [Note: Here "the law" appears to refer to the Old Testament Scriptures generally, since Psalms and Isaiah are quoted. See verses 10-18]. This is so that the mouth of every objector may be stopped [i.e., from making excuses for his sin], and thereby bring the entire world under God's judgment [i.e., both Jews and Gentiles]. Now we know that what the law says, it speaks- to those who are under the law, that every mouth may be stopped, and all the world become guilty before God. Now we know that whatever the law says, it says to those who are under the law, so that every mouth may be stopped and the whole world may be held accountable to God. Now we know that whatever the law says, it says to those who are under the law: that every one may be silenc'd, and all the world plead guilty before God. But we know that so many things as the law speaks, it says to those under the law: that every mouth may be stopped, and the whole world may become guilty before God. Now we know that everything the Law says is addressed to those under its authority, so that every mouth may be shut, and the whole world be made accountable to God. Now we know that whatsoever the law saith, it saith to them that are under the law; that every mouth may be stopped, and all the world be found guilty before God. Now we know that all that the law says, it says to those who are under the law, that every mouth may be stopped, and all the world may submit themselves unto God. And we know that whatever says the law, it speaks to them in the law: that every mouth be shut, and all the world be culpable to God. Now we know that whatsoever things the law says, it says to them who are under the law: that every mouth may be stopped, and all the world may become guilty before God. Now we know that whatever the law says, it speaks to those under the law, in order that every mouth may be closed and the whole world may become accountable to God. Now we know that whatever the Law says, it speaks to those who are under the Law; so that every mouth may be shut, and all the world may be brought under the judgment of God. Now we know that whatever the law says, it says to those who are under the law, so that every mouth may be silenced and the whole world may be held accountable to God. Now we know that whatever things the law says, it speaks to those who are under the law, that every mouth may be closed, and all the world may be brought under the judgment of God. Now we know that whatever the Law saith, it saith to those who are under the Law; that every mouth may be stopped, and all the world become subject to condemnation before God. But we know that whatever the law says, it says to those having the law, that every mouth may be stopped and all the world become guilty before God. Now we know that, whatsoever things the law saith, to them who are within the law, it speaketh, in order that, every mouth, may be stopped and all the world come, under penal sentence, unto God. Now we know that whatsoever things the law saith, it speaks to those who are under the law: that every mouth might be sealed up, and all the world become criminal before God. Now we know that everything said in the Law is addressed to those who are under its authority, in order that every mouth may be closed, and the whole world become liable to the judgment of God. Now we know that whatever things the law saith, it saith to them who are under the law: that every mouth may be stopped, and all the world may become guilty before God. But it cannot be denied that all that the Law says is addressed to those who are living under the Law, in order that every mouth may be stopped, and that the whole world may await sentence from God. Now we know that everything the law says is spoken to those who are under its authority, that every mouth may be stopped and the whole world be held responsible to God. 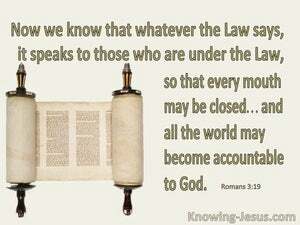 it saith to those under the law: that every mouth may be stopped, and all the world obnoxious to the justice of God. 18 "THERE IS NO FEAR OF GOD BEFORE THEIR EYES." 19 Now we know that whatever the Law says, it speaks to those who are under the Law, so that every mouth may be closed and all the world may become accountable to God; 20 because by the works of the Law no flesh will be justified in His sight; for through the Law comes the knowledge of sin. so that you may remember and be ashamed and never open your mouth anymore because of your humiliation, when I have forgiven you for all that you have done," the Lord GOD declares. "He keeps the feet of His godly ones, But the wicked ones are silenced in darkness; For not by might shall a man prevail. and he said to him, 'Friend, how did you come in here without wedding clothes?' And the man was speechless.